After shaping the Netbook market for the past year with its Eee PC brand, Asus is attempting to shake up things further with the N10J. Unlike its Eee PC siblings, the Asus N10J targets a different market with business users ﬁrmly in its sights. As such, it carries a more expensive price tag – starting at £499 (inc. VAT) – more grown-up styling and improved build quality. It's the largest Netbook we've seen to date – the 10.2-inch screen and 1024 x 600-pixel resolution is standard, but a thick bezel around the display makes this machine closer to 12.1 inches in size. With a weight of 1.5kg, it's also one of the heaviest Netbooks. The extra weight is down to the use of a dedicated nVidia graphics card – a ﬁrst for a Netbook. It's an unusual choice, but it gives the N10J a level of performance previously unseen on a machine of this size. However, the extra power is bound to affect battery life. Unfortunately, we had a pre-production unit, so were unable to carry out extensive benchmarking. Although some users will lament the loss in mobility, the larger chassis is a boon when it comes to usability. The keyboard is more comfortable than all but the HP MiniNote, and the touchpad is also large. Finished in a glossy champagne colour, along with a gloss-black screen surround, the N10J uses chrome highlights to create a premium feel. Build quality is impressive, with sturdy plastics used throughout. As with other Netbooks, the price is kept down by the use of an Intel Atom processor, in this case backed by 2048MB of memory. It has to run Windows Vista, which it does reasonably well, but don't expect to multi-task without a degree of lag. Storage comes in the form of a mechanical hard drive, and you'll ﬁnd 320GB for storing your ﬁles. Although more capacious than the flash drives found in many rivals, it also consumes more power. In a bid to back up the price, you'll ﬁnd speakers by audio manufacturer Altec Lansing. Connectivity is impressive for such a small machine – an HDMI port means you'll be able to hook up a high-definition (HD) TV and watch any HD ﬁlms you've downloaded, and there are three USB ports for connecting peripherals. In line with its corporate aspirations, an 802.11n Wi-Fi chip is included as standard. 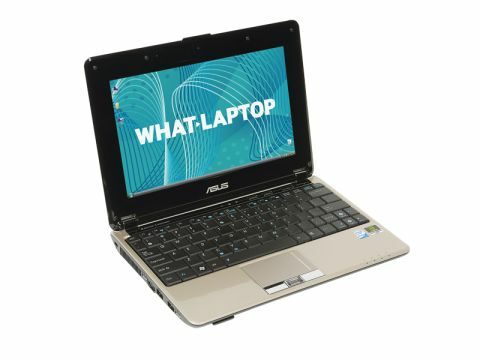 Although a capable and comfortable Netbook, it's difficult to see just who the Asus N10J is aimed at. No longer a student or blogging device, this is a budget ultraportable. The use of a dedicated GPU means the odd game can be played, but it pushes up the price and limits mobility. More importantly, you'll still be limited by the budget Intel Atom processor.